Vitamin D – Sunshine for You! A Day without “D” is like a day without sunshine…. This week Judy shares the health benefits of “D” in your life. Events and Specials… March On! With the hint of warm breezes in the air ….and with a SPRING in our step – let’s stay healthy! 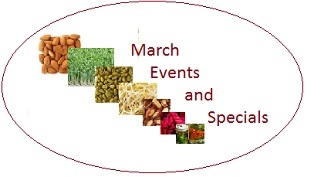 See what Judy has special for March. That can be a very good thing… watch Judy in this week’s video spin those circles into tasty recipes.